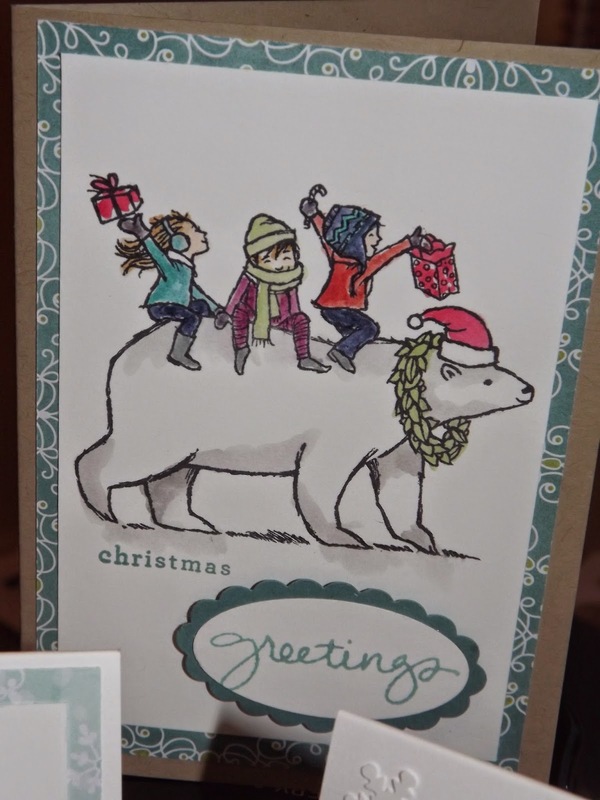 This is something different that I found on pintrest My thanks go to Stamp-ing: Bloghop van het Treasure team! This card isn't quite finished yet but in my minds eye I know just what it will look like. The central window needs a 3d back on it then you pop a tea light in there and you get a flickering forest. Those new tea lights with batteries are brill for all sorts of makes. I think I will be trying this in other colours to see which works best. Watch this space for more details. This is a cheeky little set. At first I wasn't that taken with it but it has grown on me. This is a quick little card, but it takes time to dry as I have used dazzling details for the fur and the beard. Stamped in memento ink I coloured the red with the Real Red marker pen. Very easy. By making the tag just 2" wide I was able to punch the top with the tag top punch which made it easy to add the Real red ribbon. Cheery and bright are the words that come to mind. My second party of the week was for another friend. She had asked not 'to do' Christmas. As this friend is quite new to Stampin'Up! I chose a set that was versatile and also had a good range of sentiments. Having the sentiment for what I needed was one of the problems I found when I first started. Blooming with kindness is one of my favourite sets alongside Wetlands. I love the aqua painter, (or water brush as I call it!) I just wish I had had a bucket load of these when I was teaching in primary it would have meant a lot fewer crumbles from the school caretaker as he mopped the carpet in my room yet again, as a jar of water went crashing! I had a couple of bits of left over ribbon so made a second card on the same theme. New weekly deals have been added to the special offers page. New items have been added to the clearance rack. Well last week was so hectic. I was out every evening, not something that happens very often. I sing with All Souls and we have a concert in a few weeks, so we have two rehearsals every week. The music is lovely and very varied. I also had two crafting parties. For the first one I had been requested to do a Christmas 'make and take'. This is what everyone made and took home. It is a lovely stamp set with a matching punch. My friend Chris, the hostess fed us with the most wonderful Lemon Drizzle Cake she had made, then everyone shopped. A really successful evening. This has to be one of my favourite stamps. I just love polar bears. I like stamping with this as there is just enough colouring. Its not as versatile as many stamp sets, its just so cute. All stamped with momento ink and coloured with a water brush and inks. Getting the shadow onto the polar bear with smokey slate brings the polar bear to life. My next ones will have the polar bears hat covered with crystal glaze just to give it a pop. 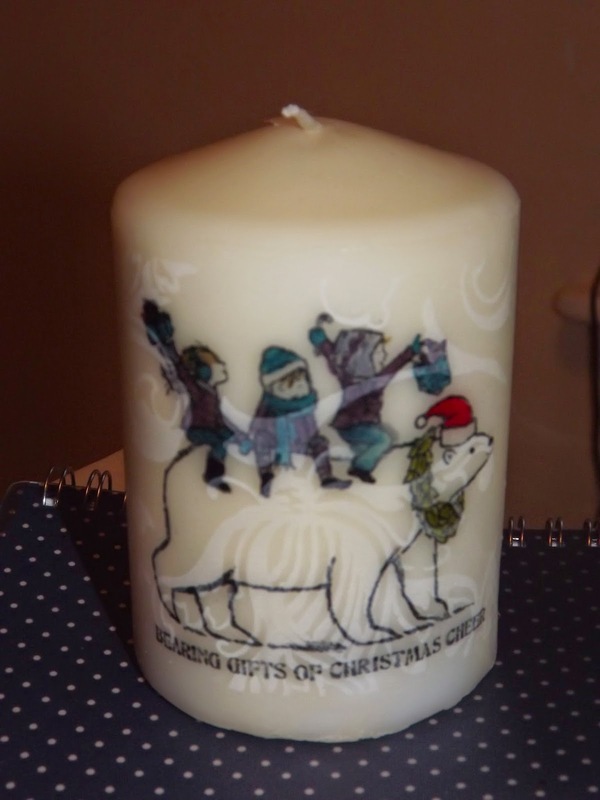 The process of putting the stamped image onto a candle is interesting. I have stamped onto patterned tissue paper then coloured with the marker pens. You then wrap the tissue paper around the candle. You hold this tissue paper in place with greaseproof paper or baking parchment. When you use the heat gun to 'melt' the tissue paper into the candle you need to be careful not burn yourself. You can lift the baking parchment to see how the tissue paper is doing but if you need to heat further replace the parchment. My first attempt without the parchment paper was very disappointing the candle was not smooth enough. It is effective and makes a lovely gift when boxed, with a matching christmas card. This is another class that will be listed over the next few days. Get in contact if you would like private class. Minimum 4 people. 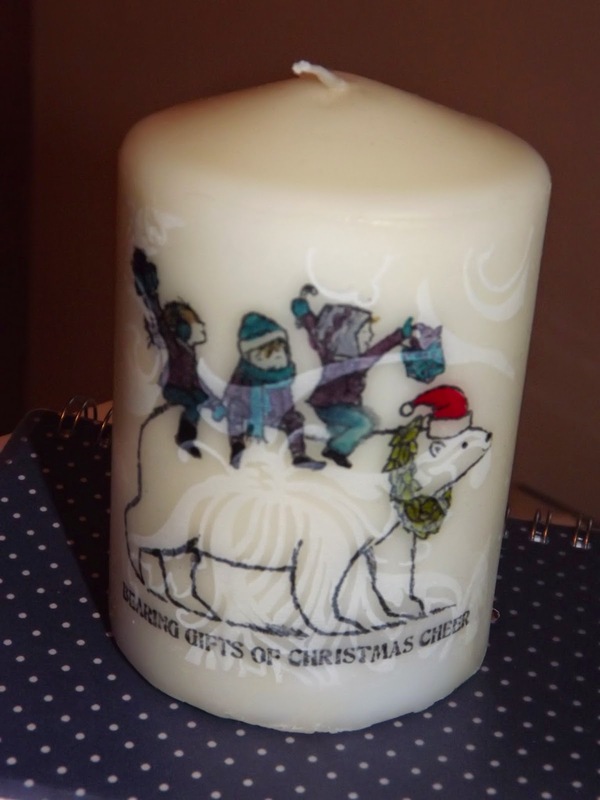 £15 Includes the stamp and one candle. 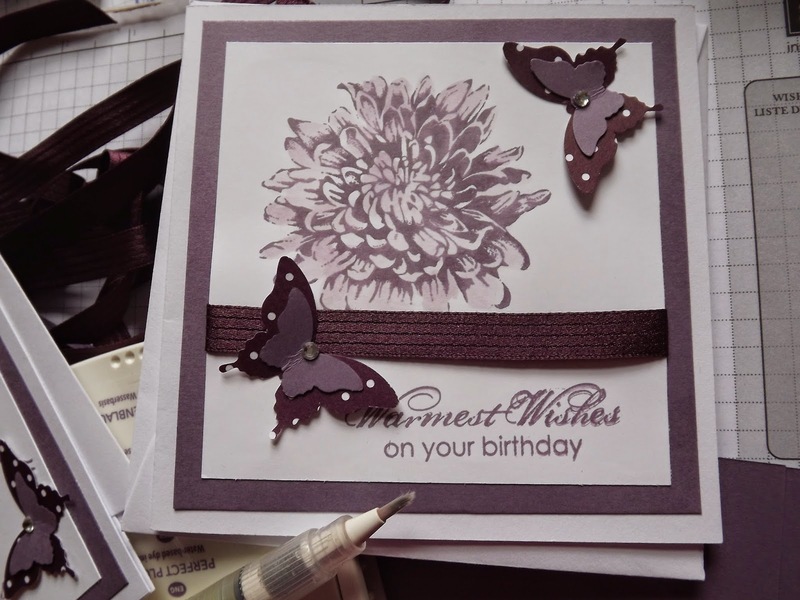 This first picture shows a selection of cards made with the Endless Wishes stamp set. I have used 3 colours of ink. Night of navy, coastal cabana and silver. 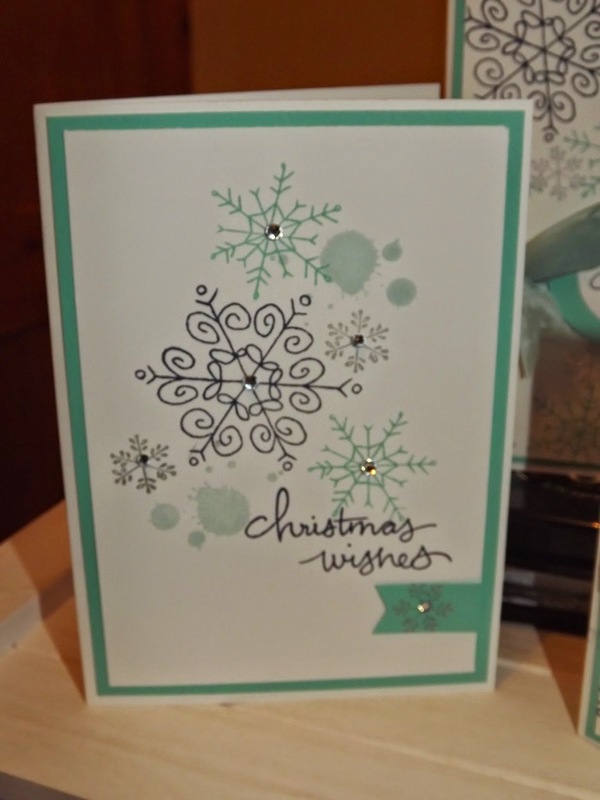 Using the different sized snowflakes in one colour. The smallest is the silver which doesn't show very well in the pictures. Each has been layered up with coastal cabana card. This stamp set has such a wide selection of sentiments, I could have made another 1/2 doz cards each with a different one. Good value for money! I am running a class using this stamp set on Wednesday afternoon 29th October 2 -4 pm and 7.30 - 9.30. Further details will be added to the Events, Classes and Workshop tab over the next week. Please get in contact if you want to reserve a place now. This looks stunning but is actually quite easy to make once you have done your cutting out accurately. 5 x A4 Night of Navy 16cm x 14cm. 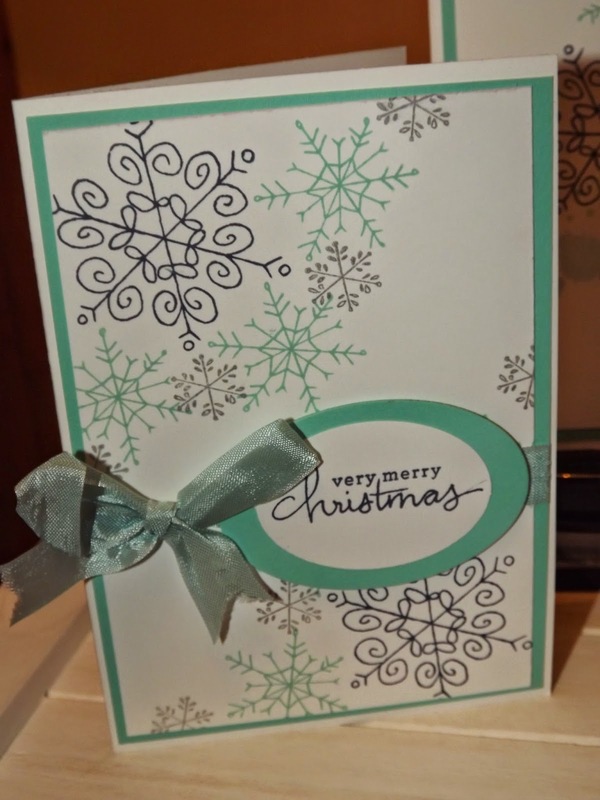 I used the White Christmas stamp set as it lends itself to making 5 different pictures. 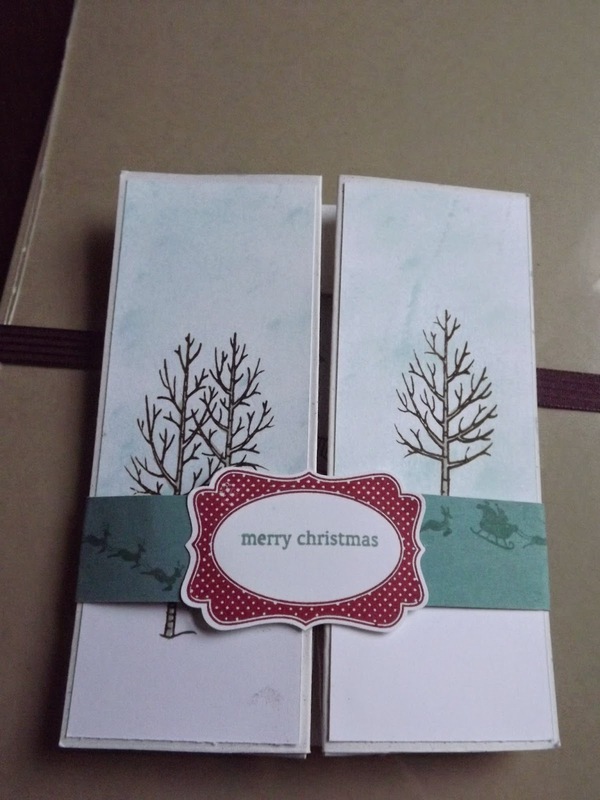 Starting with the whisper white card Stamp the trees onto the centre of each piece. Add the other items to each page until you have 5 pictures with as much detail as you want. Score the white, soft sky and lost lagoon down the centre. Fix tape to the front edges of each sheet of Lost Lagoon, carefully fix the soft sky to the tape, ensuring the front edges are level. Add the white in the same way. You should now have 5 little books, Join these 5 books together, gluing them together very carefully to ensure all front edges are level. 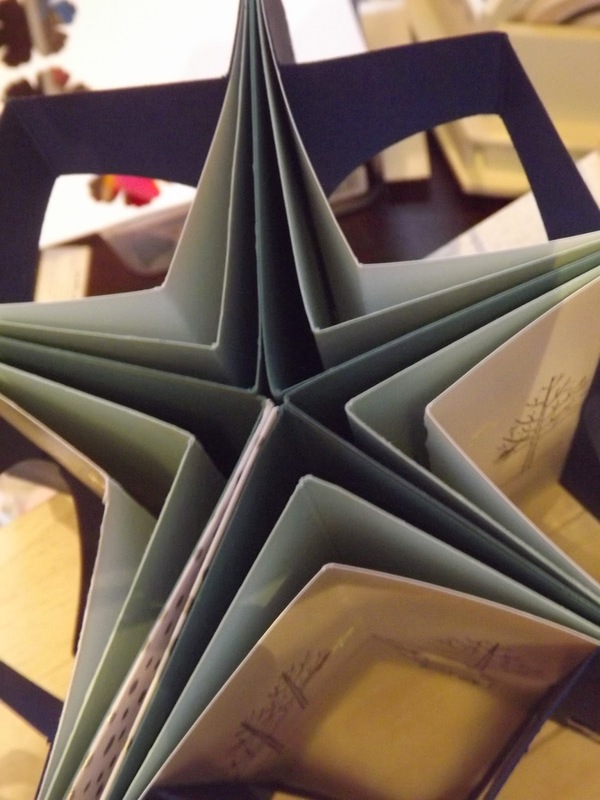 Use the star edge punch along the edges of the navy then die cut a cycle out of the centre. Fold and score the navy at 2cm intervals giving 2 valley and one mountain fold. Add this to the front of each picture. To make the cover, cover a piece of card 10cm x 14cm with some dap. Lay ribbon around the book and tie in a bow. Stick the covers over the ribbon ensuring the ribbon over the spine allows the book to close. These are my pages. It looks like I have cut a heart shape out but it is a circle! This last picture is my cover. I have decorated it with the stars that come out of the edge punch. These are now on the special offers page. In colour marker pawns are a must buy this week. I also volunteered to do an Inspiration Station at the team training event. This is a picture of how my station looked. I shall post details of each project over the next few days. So I thought I would share the swaps that I received. You have no idea how many ideas I now have swimming around in my head. There are 2 cards missing from this selection as I wanted to show them individually. The first has been created by Sam Wilson. 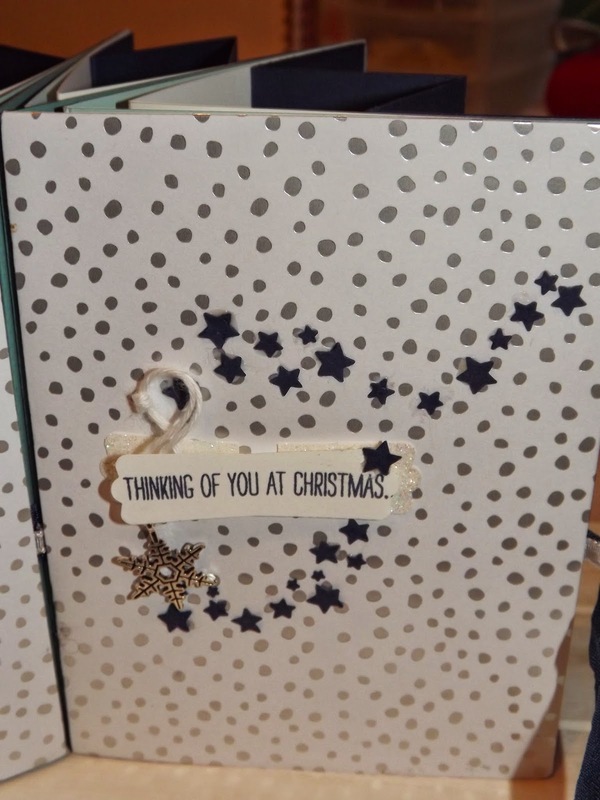 Its a step card, the flying father christmas is embossed with silver. The whole card is just beautiful. 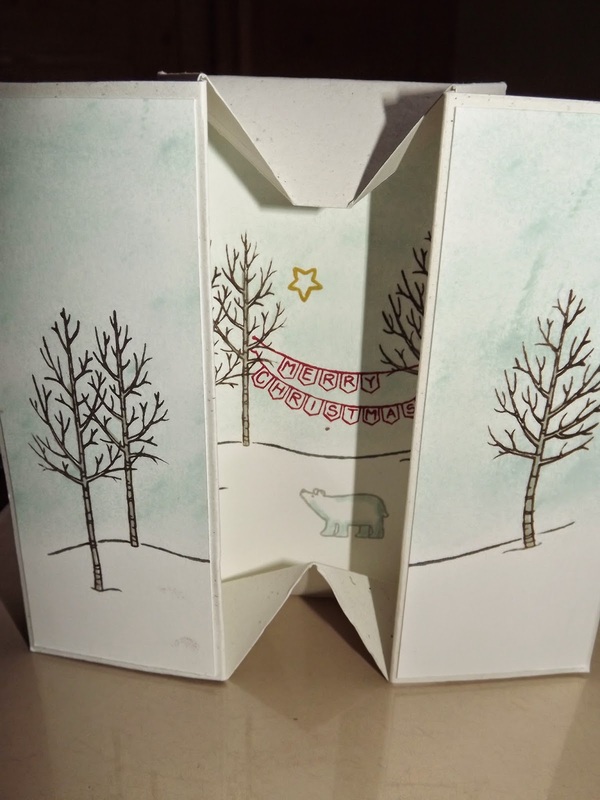 The second card I wanted to feature was from Nicola Baker. I love the folding and am going to have a go at making something similar. Saturday was team training day. A feature of these training days is swaps. Its a wonderful way of gaining lots of ideas very quickly. Each person attending training makes an item for everyone else. So I took 24 curvy keepsake boxes and came home with 24 different items. These are my boxes stacked in the wicker basket. I have used vellum to cut them out of then put a piece of silver card in the bottom to give them a little more strength as I had chocolate to put in each one. This box is made of plain vellum but I have used the new star edge punch along the two longer edges. It really gives the box a different look. This little box is cut from the silver spotted vellum, I also made some in the silver stripe vellum. 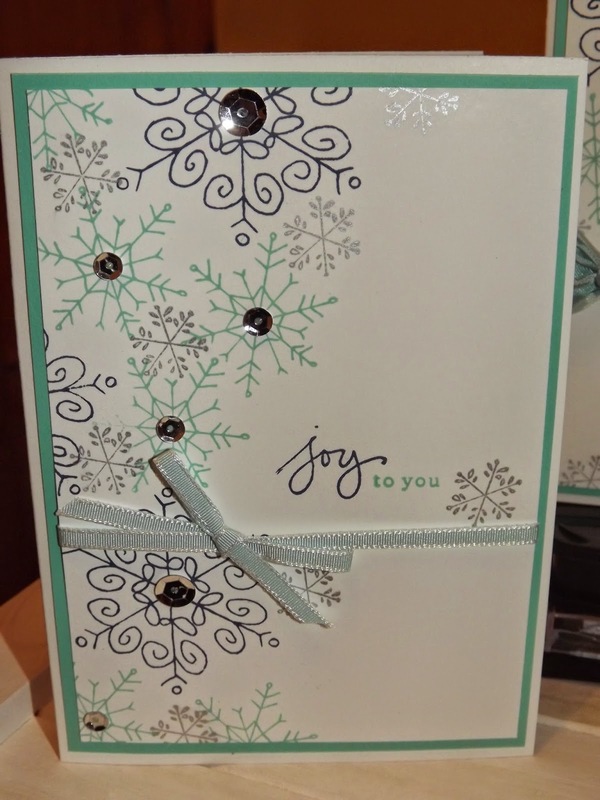 I added a tag stamped with 'endless wishes' snowflakes, then cut with the second smallest of the star framelits. If you are looking for a great way to meet new people, have fun and earn a little money along the way, get in touch to join my team. I haven't been around much on this week as I have been preparing for an 'Inspiration Station' at our team training day on Saturday. I will reveal all next week. So many lovely goodies in the seasonal catalogue. I sing with a group every Thursday and it is our AGM tonight. I was asked to make a card as one of the members has been with the society for 50 years. She is a lovely lady with a really good voice, knows her music and is always willing to help out. This picture shows the card front. The Big Shot has worked overtime this week. Here I have used the banner framlits and the old number dies. This picture shows the Gold Soiree papers. They are speciality papers as 4 sheets are shiny! And incorporate gold in the design. They are lush. The gold fold paper is also really lovely to work with. And of course there had to be a lovely sentiment on the inside. 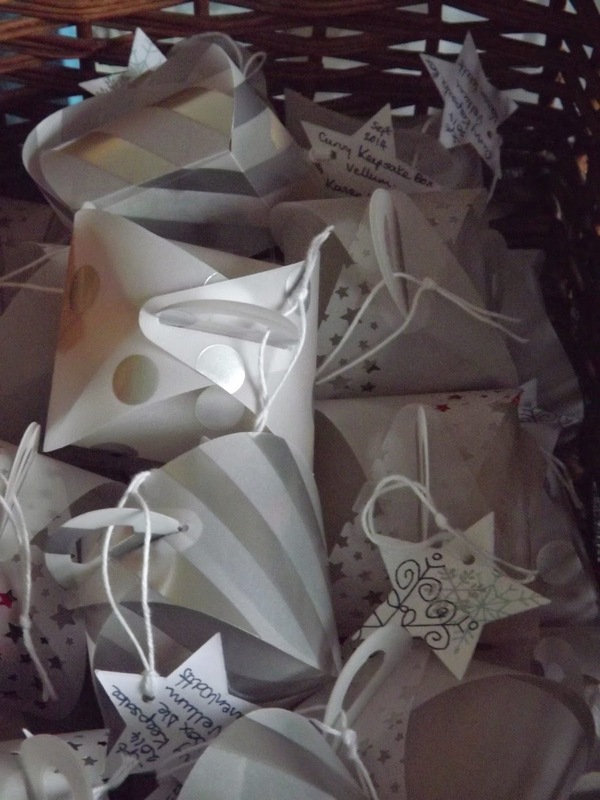 Here are the goody bags ready and labelled for the workshop for 15 lovely ladies. Not started yet, just getting comfortable and chatting to friends.